Extending the 710 Freeway from Alhambra to a proposed interchange with the 210 Freeway in Pasadena has been one of the more hotly contested issues in the San Gabriel Valley for almost half a century. The freeway extension, which many in communities such as Alhambra, South Pasadena and Pasadena argue will greatly increase local traffic and pollution, is now being studied by Metro, Los Angeles County’s governing transportation authority which is charged with considering several options to improve north-south traffic circulation, including a no-build option; a bus rapid transit (BRT) option; a light rail transit (LRT) option; and the controversial freeway tunnel alternative, which would connect the 710 and 210 with a $5.6 billion tunnel. When the public comment period for the State Route 710 North Study’s Draft Environmental Impact Report and Environmental Impact Statement (EIR/EIS) closed last August, Metro had received more than 8,000 comments from various stakeholders. The organization, in cooperation with Caltrans, is now preparing responses to the comments and believes this process will take the remainder of the year. Once all the responses have been sent out, Metro’s 710 project team will identify a preferred option and finalize the EIR/EIS. Its preferred option will be recommended to the Los Angeles County Metropolitan Transit Authority Board of Directors and Executives, which will have the final say on how to move forward. The 710 project team will continue to provide updates to stakeholders, allowing government jurisdictions and 710 activist groups plenty of time to discuss their stances with the many communities of the San Gabriel Valley. City Council member Steve Talt recently restarted the 710 conversation in San Marino. “My desire in opening up this Pandora’s box on the 710 was not necessarily to change our perspective, but to understand why we take the position we do,” he said. The San Marino City Council passed a resolution in support of the completion of the 710 in 2012. Talt and fellow City Councilman Steven Huang met with Alhambra Vice Mayor Stephen Placido on April 13 regarding the 710 extension project. The meeting gave these elected officials an opportunity to look at alternative solutions to north-south traffic in Alhambra, like focusing density closer to the 10 freeway. San Marino Vice Mayor Richard Sun and Los Angeles City Council member Paul Krekorian attended a meeting of the 710 Coalition on March 31. The 710 Coalition, an organization of cities and other community groups in favor of the completion of the 710 freeway, has plans for a community engagement tour starting in the summer. Providing workshops to cities interested in talking about the tunnel alternative will be one component of the tour. Rosemead City Council member Steven Lee said the 710 Coalition has been working with its consultants and traffic and engineering teams to prepare a presentation highlighting the positive impact of the extension. “The data speaks for itself,” he said after listing some of the positive findings in the draft EIR/EIS. Organizations opposed to the 710 tunnel alternative are making preparations, as well. Beyond the 710 (BT710), an assemblage of cities, organizations and individuals, has a new “multimodal great streets alternative” proposal. He added that the lack of an alternative of this kind in the draft EIR/EIS is a “significant and fatal flaw” in the document. The proposal, which came together with the help of the transportation firm Nelson\Nygaard, provides an alternative to the no-build option that King suggests would mitigate traffic impacts without building the proposed freeway tunnel. BT710 will continue to be talking with stakeholders and gathering reactions from them about the proposal until there is a recommendation made by Metro. Today’s monthly Metro board of directors meeting was one of the less eventful ones; it was sort of a lull in the news swirling around Metro’s planned November sales tax ballot measure. Nonetheless, there were a number of items that SBLA readers might find interesting. SBLA has been noticing recent social media mentions of Metro subway riders receiving texts while on board. Metro CEO made it official today, announcing that, from Union Station to 7th Street Station, wireless service is operational for Verizon customers. According to Metro “Sprint and T-Mobile have signed-up to provide service which will be available in two to three months. Negotiations are ongoing with AT&T.” More details at The Source. The board approved environmental clearance for Metro bike-share, coming to downtown L.A. this summer. The project was certified to be categorically exempt, meaning that expensive, time-consuming environmental impact studies are not needed. Metro is in the final stretch of its planned bus service reorganization, slated for implementation in June. Metro held a series of public input sessions, the outcomes of which were presented to the board. The most contentious items were three Metro bus routes transitioning to other municipal operators. Lines 190 and 194 [PDF] (El Monte Station to Cal Poly Pomona) would be operated by Foothill Transit. Line 270 [PDF] (Monrovia to Norwalk Station) would be split between Foothill and Norwalk Transit. Metro’s public input and service council had recommended against shifting the service to Norwalk Transit. Bus drivers union representatives oppose any outsourcing of Metro bus service to municipal operators. Numerous representatives from Foothill Transit leadership and staff spoke in favor of the hand-off. County Supervisor Don Knabe put forward a motion to support the proposed transitions to both Norwalk and Foothill. The motion passed. Foothill Transit has electric buses – under a Garcetti motion, Metro may soon join them. Image via Foothill Transit. The board approved a procurement process for 850 new replacement buses from 2018-2022. 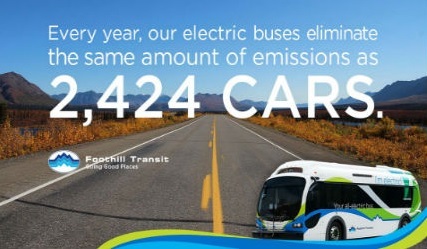 The buses would either be Metro’s current CNG (Compressed Natural Gas) standard or Zero Emission (presumably electric.) Mayor Eric Garcetti offered a supplementary motion, approved unanimously, to have Metro study how it can transition to a fully Zero Emission bus fleet. Metro approved a $5.1 million contract to purchase 54 new TAP card vending machines (TVMs). These will replace and augment existing TVMs at stations, including expanding Silver Line TVMs to support the agency’s all-door boarding pilot. Inglewood Mayor James Butts offered a supplementary motion, approved unanimously, to have Metro study how to add TVMs at key locations for municipal bus operators. Representatives from Santa Monica’s Big Blue Bus requested TVMs at the LAX Transit Center and at Pico-Rimpau. 710 North Tunnel opponents weighed in vehemently during public comment on a staff recommendation that Metro oppose State Senator Carol Liu’s SB 1018. Opponents of the 710 freeway project continue to be vocally opposed to a future Metro sales measure if there is any possibility that it could fund the destructive 710 North freeway expansion. SB 1018 would dictate how a 710 North project cost-benefit analysis would be conducted. Metro legislative staff recommended the agency oppose the bill because it intervenes in Metro’s ongoing environmental review process. Glendale City Councilmember Ara Najarian, a stalwart 710 Freeway tunnel opponent, disagreed with Metro staff. Ultimately the board voted to oppose SB 1018, with Najarian and County Supervisor Sheila Kuehl casting dissenting votes. Bertha getting ready to dive under the viaduct. What could possibly go wrong? Bruce Harrell seemed like he was in a hurry. State representatives were answering questions from city council members about the plan to spend two weeks drilling a giant tunnel under the Alaskan Way Viaduct, Seattle's aging elevated highway. But the Seattle City Council president reminded his colleagues that council time was ticking by. "Page four of a 19-page PowerPoint over there," he said, signaling that there were many PowerPoint pages left to go in this presentation and he wanted to move on past the questions. Todd Trepanier, the Washington State Department of Transportation's tunnel project administrator, thanked Harrell for being conscious of time constraints. Really, the state's whole presentation on drilling beneath the viaduct felt brief and perfunctory—even though as the council was listening to the briefing, workers in a hyperbaric gas bubble were undertaking some of the most challenging and expensive maintenance work on the machine to date. We don't know exactly when Bertha will be ready to dive under the viaduct after the machine's underground touch-up at "Safe Haven 3," though the state says it's sometime soon. When that happens, no one's going to be riding on the viaduct between South Spokane Street and the Battery Street Tunnel. (That much is a relief.) But bigger questions loom. In recent months, the state's contractor for the project, Seattle Tunnel Partners (STP), has come under fire from Governor Jay Inslee. Not only did Inslee temporarily halt operations after a sinkhole opened up near Bertha's cutterhead; a follow-up story in the Seattle Times revealed that state engineers and officials had worried over STP's process before the sinkhole opened up. So what happens if a sinkhole opens up while the machine is drilling underneath the viaduct? Could it affect the structural integrity of the highway itself? Why wasn't STP operating under better supervision from day one? And at what point would the viaduct become too unsafe for people to use? These are questions that some city council members have had from the beginning of the project—well before the 57-foot-wide tunnel-boring machine started running into almost every problem imaginable. But now, just before one of the trickiest phases of the project, those questions remain mostly unanswered. 1. What happens if a sinkhole opens up while Bertha is drilling underneath the viaduct? Short version: "We don't know," according to the state. "There are many measures STP can take if they see a loss of soil; one measure is injecting grout into the ground from inside the machine," Washington State Department of Transportation (WSDOT) spokesperson Laura Newborn told me in an e-mail. "A soil loss does not necessarily result in a sinkhole." In addition to emergency grout-shooting, STP has also inserted steel micropiles near Yesler Way—little support pillars that are supposed to stabilize the soil when the machine gets close to the bents of the viaduct. 2. If a sinkhole opens up beneath the viaduct, could it threaten the structural integrity of the highway itself? "We can't speculate, as every situation is different," WSDOT's Newborn said. "As Todd [Trepanier] mentioned in his presentation, we will have a command center operating 24/7 as the machine is tunneling underneath to quickly address any situation that might develop." Thom Neff, the infrastructure consultant former mayor McGinn once hired to assess the tunnel project, has a different view. "They're still in an area that's classified as urban fill, which is very, very complicated," Neff said. "They claim they've done a lot of grouting underneath the viaduct and have reinforced concrete piers, but if a sinkhole develops while Bertha is under the viaduct, it causes potential danger and risk to the foundations, and I would think at that point either SDOT or WSDOT would declare the viaduct unsafe and not reopen it. If something happens while it's under it, I think it's a whole new ball game." 3. So when does the viaduct become too unsafe to use? Todd Trepanier told the city council that a March viaduct inspection showed no new cracks, which was a good sign. That said, the same inspection found 5/16 of an inch of additional settlement by Seneca Street, and between 1/8 and 1/4 of an inch of settlement near the Columbia Street on-ramp. "I've been frustrated with the lack of clarity on questions, specifically around at which point does the viaduct become so unsafe that we close it short-term or permanently," city council member Mike O'Brien said. "The answer we got is: 'It depends.' And 'It's too complicated for us to actually describe.' That continues to be a sore point for me." Neff, McGinn's former tunnel consultant, told me no one in his field is willing to go out on a limb and call the viaduct "safe." "You'd have to be insane to do that," he said. "And if you have another earthquake somewhere along the line, you don't even want to think about that." 4. ANYWAY, so you guys are SURE everything tunneling-wise is A-OK, right? It's all gonna be great? City council member Rob Johnson said he was encouraged by the fact that the state had brought in new levels of oversight for tunneling going forward. "I have to take [the state] at face value when they're the technical experts," Johnson said. "If they feel like what they're seeing is an improvement, I have to take their word for it." Of course, the state has only been able to witness improvement from STP over the last 300 feet, since that's when Inslee made STP stop and reassess their work. But if—if—there is a silver lining to moving forward with drilling under the viaduct, Council Member Mike O'Brien believes it's showing the public that we might not need the viaduct (or the goddamn tunnel, for that matter) at all. "I'm encouraged to see that the volume of traffic on the viaduct has been cut nearly in half to 60,000 vehicles a day," O'Brien said. "That makes our challenge around a closure that much more manageable. It also raises the question of whether we should have been spending billions of dollars on the tunnel in the first place." 5. So yeah, wait, why are we doing this again?